June 14, 2012 By arzea 4 Comments This post may contain affiliate links. Read my disclosure policy. I was talking with some friends recently about the wonderful pizza’s that can be purchased at Costco. They are huge, tasty, and under $10, which to me, is awesome and amazing. 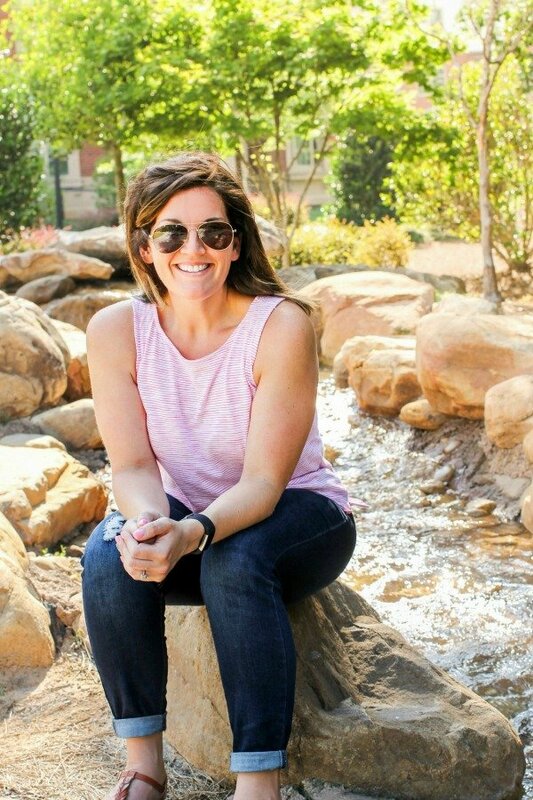 Sometimes I go to Costco just to get the pizza….I don’t know why people stare at me when I get in line and that is the only thing I have in my cart. Self control, people! 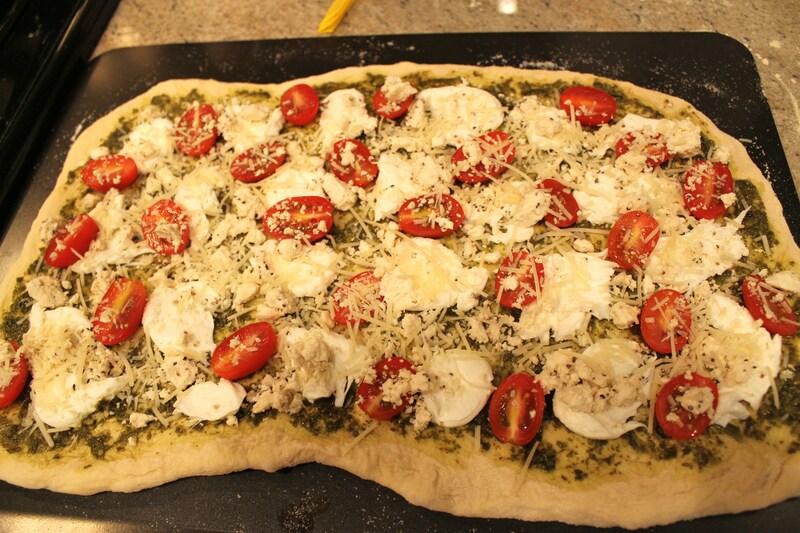 My favorite pizza at our local Costco is one with Pesto, tomatoes, mozzarella, and basil. You can bring it home, bake it, and then enjoy it with no mess or hassle. It’s 16 inches of pure deliciousness. Unfortunately I can’t be making trips to Costco daily, so I decided to make my own version of their pizza, but with a couple additional ingredients, and on a thinner crust (their crust is thick and heavenly). Of course I ventured to Trader Joe’s to pick up my favorite .99 cent pizza dough and other ingredients. I really need to get a stand mixer, but if the only thing I used it for was pizza dough, would it really be cost efficient? I mean, I would have to make like 300 pizza’s to make it worth it. Surely that will take years, so I am still skeptical. I would accept one as a gift though, of course. 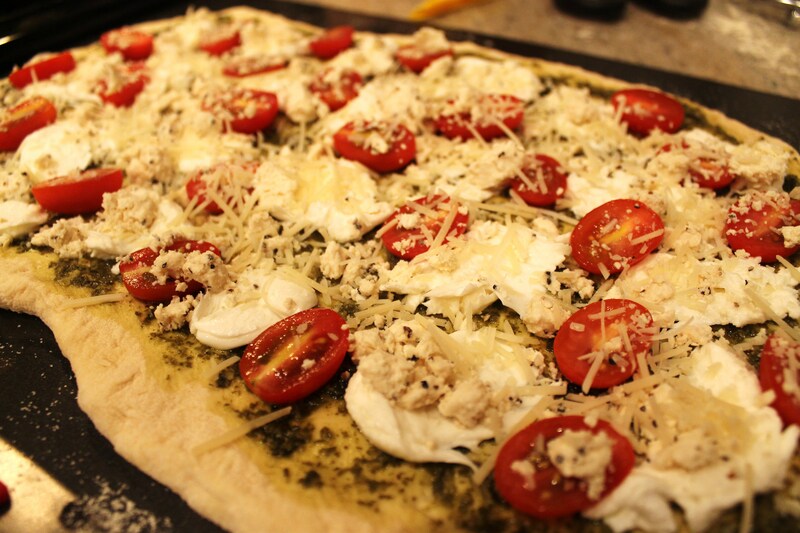 Anyway, I decided this pizza would have mozzarella, cherry tomatoes, pesto, and extra basil on top. 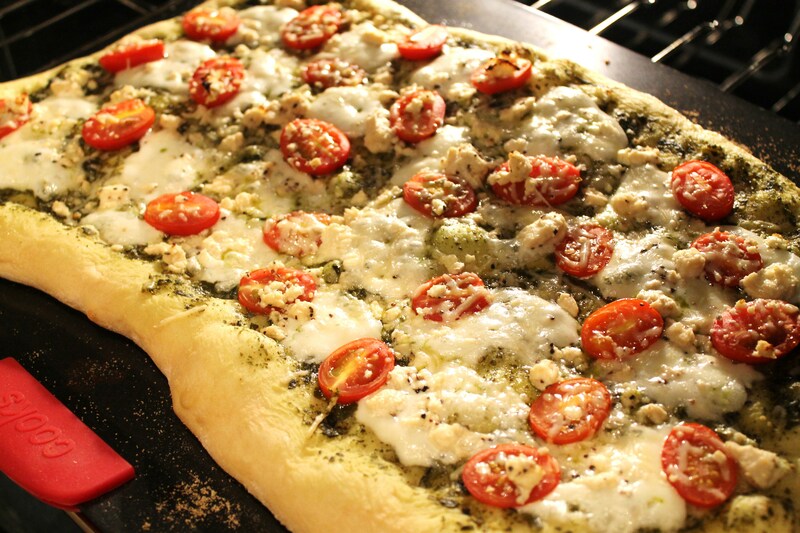 When I got home, I decided it would also have feta (a delicious feta with peppercorns….yum! 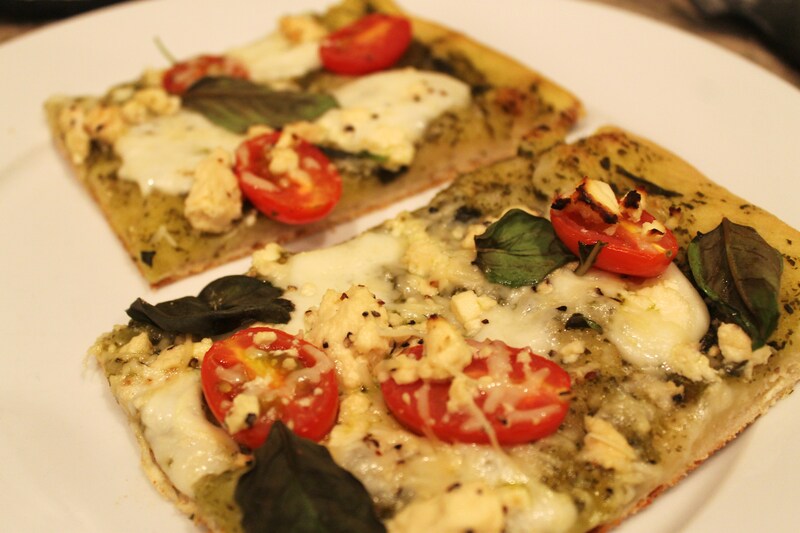 ), because I love feta on pizza and we have a ton of it in our fridge. The pizza cooked up quickly and turned out delicious. I still need to learn how to best put the basil on top while cooking. Do I put it on after? The last minute? I don’t know, but it always comes out scorched for me…so I would suggest probably putting it on after the pizza is cooked. 2. Sprinkle a light layer of flour on counter and place dough on top. Work dough into a pizza shape (I never have a solid shape, but just try to work it evenly). Place dough onto pan or whatever you will be cooking it on. 3. 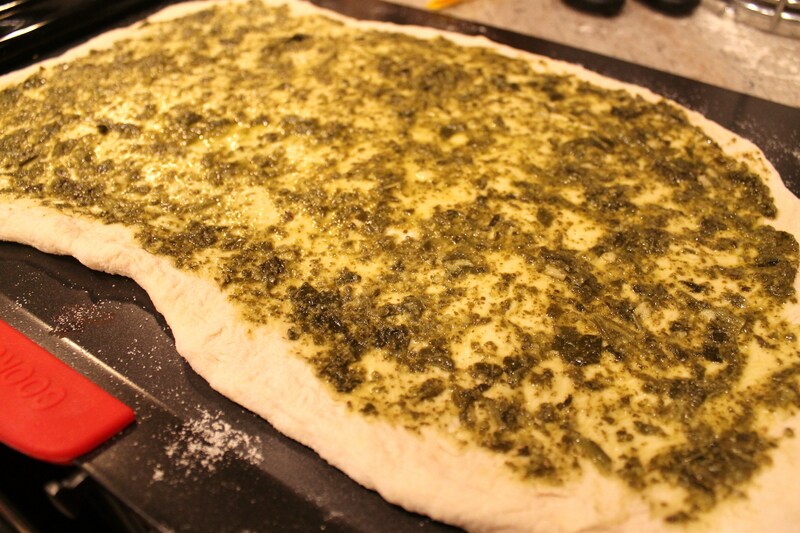 Spread pesto onto dough, leaving a little room at the edges for a crust. Lay mozzarella cheese across pizza. Add tomatoes, feta cheese, and top with Parmesan cheese. Brush a light layer of olive oil over the exposed crust. 4. Place pizza into oven and cook for 12-18 minutes, checking after 12 minutes to see if it's done. 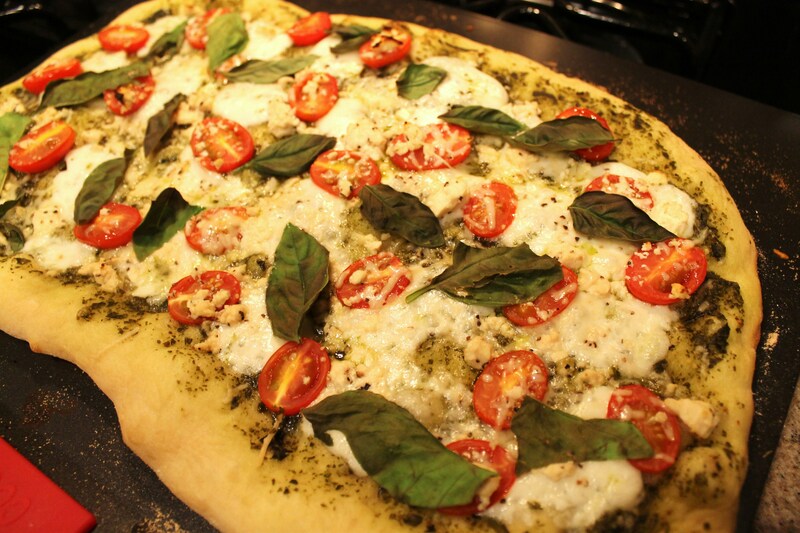 Remove Pizza from oven and top with basil leaves. Turn oven off. Put pizza back in over for 1 minute. Slice and serve. « Substitute Greek Yogurt for…..Everything! Looks delicious! Yum. Love your new cover photo. Another trick you’ll have to teach me. lol. 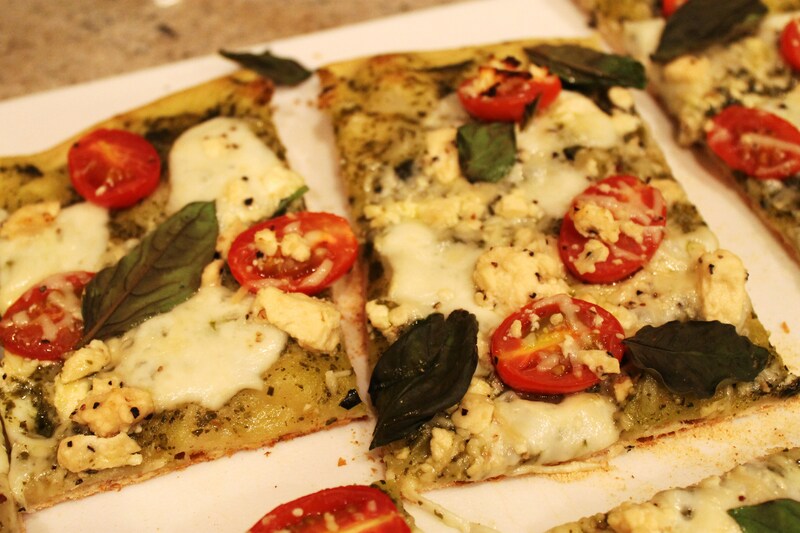 I love feta on pizza! Me too! You know, I have actually been to some pizza places that say they can’t put it on pizza?!?! Blasphemy!